Back in centuries past, when the winters in London were colder than they are now, and the River Thames less contained and fast flowing, the River would on occasion freeze over. When the river would freeze over, frost fairs were held on the frozen water. These fairs involved "sleds, sliding with skeetes, a bull-baiting, horse and coach races, puppet plays and interludes, cooks, tipling and other lewd places, so that it seemed to be a bacchanalian triumph, or carnival on the water," as described by writer John Evelyn. The last frost fair was held in 1814. Milder winters, along with embankments being built along the banks of the river and the new London Bridge allowing the water to flow faster through its larger arches meant the river has not frozen over since. However, there still are opportunities to enjoy a touch of the frost fair in London. 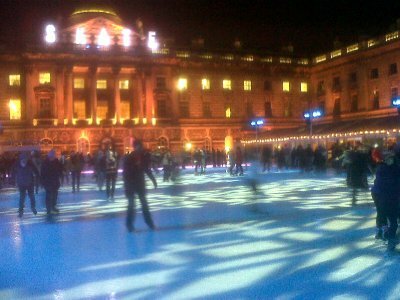 Each year Somerset House gives over a large portion of its courtyard to an outdoor ice rink. 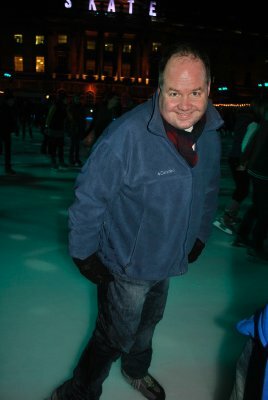 I went recently with a bunch of co-workers for an hour of ice skating. 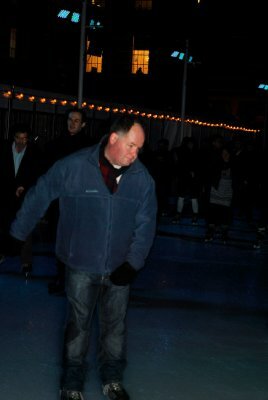 As a Canadian, I learned to ice skate at an early age. 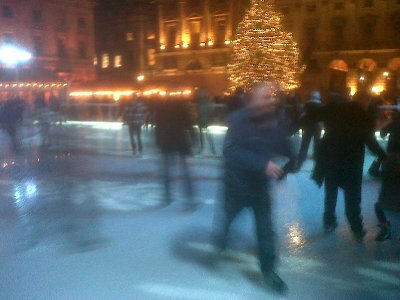 I wasn't ever really very good at it, though, and as compared to other Canadians, am a weak skater. 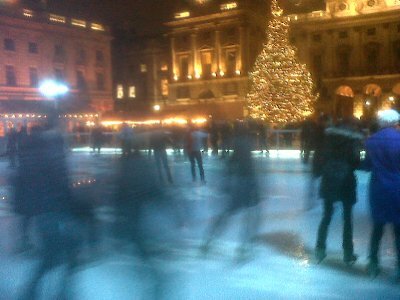 The great thing about skating in the UK is that most of them haven't ever been on skates, and are quite poor. 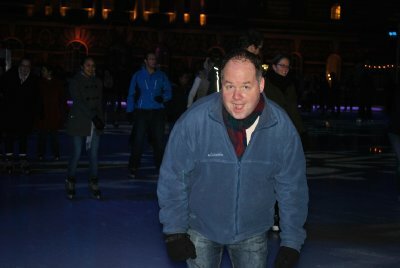 Whereas on a Canadian rink, I look like a rank amateur, on an English rink I am in the top 10%! It's a real ego boost. I would recommend it for any Canadian living in the UK. Not to say I'm by any means perfect. I did fall once, trying to stop a little to fancily in front of my coworkers. Bit of a wet leg after that... Oops. 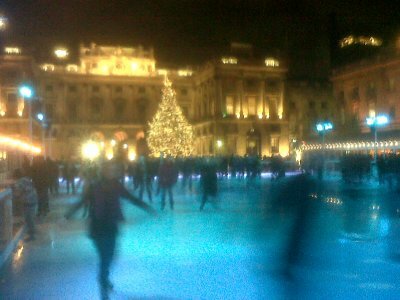 But for the most part I did well on the ice. And it was fun to get out. I think I'll go again this year. It is a good workout, quite fun, and at £15 for an hour, cheaper than the gym.